Just wanted to drop you a note to say I thought Richard did a great job at the weekend. He spent time at the start discussing the conditions and was really informative throughout. He's got a good manner and even with the blizzard, we all felt in safe hands. Best guided walk I've been on! More on the blog ! Thank you all, especially Steven! Back in Oxford wishing I was still in the mountains! Thanks Richard for your leading and teaching. We really enjoyed it! Just wanted to drop you a line to say GREAT COURSE! We had two fantastic days (the range of weather was extraordinary - the first day we had 50 mile views from the top; on the second day the conditions were arctic) in the hands of the very accomplished, very knowledgeable and thoroughly likeable and pleasant trainer, Johnnie Walker. Everything was extremely well explained with lots of useful snippets on offer throughout the two days: he packed so much in. He is simply a top notch trainer. I will definitely signing up for more. Fantastic weekend despite the dreich weather, in no small part to Kevin who was an outstanding guide. Seana Braigh was one of the best hill days I've had in 30 years and there is no doubt that was in no small part to Kevin's knowledge of the hills in general and geography and geology of the area in particular. I wanted to let you know John and Al were fantastic guides - calm, cheerful, relaxed, judging it just right. They held an impromptu meeting to ensure we were up for walking in heavy rain and wind, and then took 2 of the group up the Corbett today, again in rain. Every member of the group trusted them implicitly - they grouped us well, but also respected that there were some very experienced hill walkers in the group. You do manage to bring together great groups of people - I really enjoyed meeting this group - all singles with spouses or partners who don't want to do Munros!! 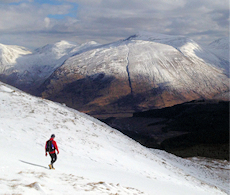 We could indulge all things Munros without being looked at as if we are mad. Although as Brian did say this morning at the cafe waiting for the ferry back to Mallaig, 'it is a bloody stupid hobby'!! I just wanted to feed back and say I had a great time on the course on Saturday. Emma was a great leader and really appreciated the time she took with everyone. I have learnt so much and makes me even more excited to get out on the hills. I would like to say "thank you" for our day on Liathach and to Dave and John for keeping us going and especially for arranging the sun to shine on both summits, so we could have great views and photos to remember ! For me it was a personal ambition fulfilled having missed this one on my previous trip to Torridon. Hi Steven, I just wanted to drop you a quick note to say a big THANK YOU to you and all the guides, everyone had a great afternoon and the feedback has been fantastic. "I was on the hiking activity. Well organised, great, friendly & knowledgeable activity leaders with a flexible approach as to which trails we took, and a relaxed and sociable group of people with differing levels of experience". "I did the Hillwalking activity which was a new one and thoroughly enjoyed it. The walk itself was good (I did struggle up the damn hill though! ), it was just the right length and the 'guides' were fab - friendly, enthusiastic and knowledgeable". Hi Steven just like to say had a fabulous two days and Johnny Walker was fantastic. I will say that the second day was probably most memorable hill day I have ever experienced. Here is to more Fallon Fives in future. Didn't get to see you at the end of today as dashing back into Edinburgh but wanted to thank you and Ollie. Absolutely great weekend ! Really super despite Saturday's weather. And I learned an awful lot. Now to get you to try cani-cross. Thanks for much. Just wanted to thank you for connecting us to Richard at the last minute so that we could still hill hike this weekend (of the 'Beast from the East'). Despite the extreme and inclement weather we managed to get there and it was really worthwhile. Richard was a wonderful guide. He was informed, knew the mountains so well, humorous and kept us safe! Please pass-on our thanks to Dave and John for an excellent day on the hill. 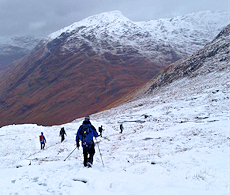 It was great to refresh ourselves and practise some Winter Mountaineering skills. For myself, it was especially useful to learn of the Scottish Mountain avalanche risk service and it's interpretation. Would just like to say a huge thank you for making the day up Cairngorm Mountain on the 28th a fantastic experience. Both Laura and myself had a fantastic day-we certainly ticked the box off on her bucket list and what an experience, the orgainising of emails leading up to the day and the professionalism of Richard on the day was faultless, even the clouds lifting on our descent was perfect. Thank you both so so much. You have certainly given us the bug and shall return to see the summer season! Just wanted to say what an absolutely fantastic couple of days we had in Glencoe. Feels like a dream now! Weather was perfect and Johnny was exceptional. I will definitely be booking up for winter walking through yourself each year now, I'm completely addicted!! Thanks so much!